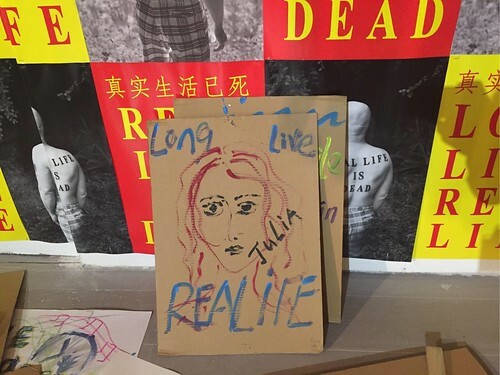 Real Life is Dead/Long Live Real Life sees ‘Realifer’ Sinclair bring his ‘Real Life’ to China. Heralding a new phase in Sinclair’s expansive ongoing project, the CURRENT exhibition will mark the days, weeks, months and years that comprise the first 23 years of Sinclair’s ‘Real Life’. A leading figure in contemporary art in Scotland, Sinclair began the Real Life project in 1994 with the words ‘Real Life’ tattooed on his back. Following this definitive act Sinclair developed Real Life as a series of exhibitions, performances and installations internationally. Acting as a protagonist the tattoo provides a visual and conceptual paradigm with which Sinclair explores the problems and tensions of being in the world. For the exhibition at Shanghai Himalayas Museum Sinclair will add the text “is Dead” to the ‘Real Life’ tattoo, propelling the project into a decisive new stage. This next phase in the character of the Realifer summons a need for a renewed sense of purpose and determination for individual and collective voices to be heard. Appearing against a global context in which it is impossible to discern what is ‘real’ whether politically, historically or economically, Real Life is Dead is a statement of commitment. Echoing the traditional phraseology of ‘the king is dead, long live the king’ Sinclair’s Real Life is Dead/Long Live Real Life is an affirmative call to the future. 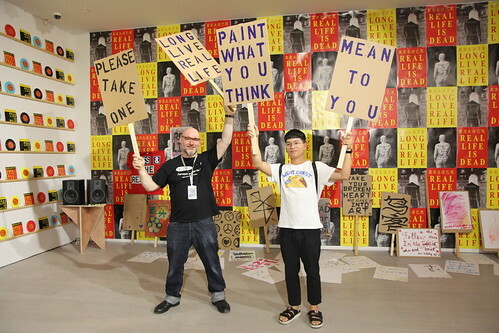 For the exhibition in Shanghai Himalayas Museum, the artist will create a new installation work consists of multiple editions, banners, music and videos that represent the years, months and days of the 23 years since Sinclair initiated the Real Life project. Sound-tracked by two new songs produced with a band of Sinclair’s students from Glasgow School of Art, Real Life is Dead/Long Live Real Life measures and marks the passage of time with an implicit ethos of collaboration; the essential condition and quality of ‘Real Life’. CURRENT | Contemporary Art from Scotland (Phase Three) is a collaborative project between Cooper Gallery DJCAD, University of Dundee in Scotland and Shanghai Himalayas Museum, in partnership with British Council. It is one of the programmes in the Spirit of Youth campaign in 2017, brought by the UK government including the British Council and Visit Britian.